Top quality home for sale in Belvidere Heights"
Pristine property surrounded by indigenous landscaped Fynbos and breath taking views of the Knysna Lagoon. Situated on a secure Private Nature Estate which consists of only 12 homes. Quality handcrafted touches give this home great character while the floor plan keeps living spaces entirely modern. The first-floor master suite offers a sumptuous bath with separate vanity and a shower enclosure. In addition to this, there are three well sized bedrooms all with full en-suite bathrooms. On the lower level, you have an open plan feeling with the dining room and lounge, all ceilings are enhanced with rope lights that set the mood for any occasion. The kitchen flows easily and is equipped with a gas hob, oven, a microwave oven and fridge-freezer all built-in. All the above Bosch appliances are included in the sale. There is a separate scullery and pantry which leads off the main kitchen. 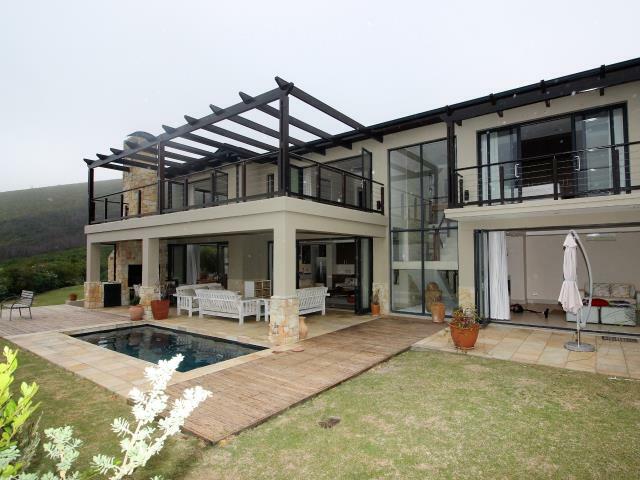 A built in braai with stacking glass doors introduces an abundance of light and invites the entertained to continue to the sparkling pool with its pergolas on either side. Double remote controlled garage which has direct access to the home. Free borehole water gets pumped to water tanks for the irrigation system for the landscaped gardens. Awake to magnificent sunrises and watch the ever-changing panoramic views of Knysna and the Outeniqua mountains in the distance and the tide changing lagoon.